Make use of what you find around your home. Old gallon jugs can be refilled and used as weights. Chairs, tables, and stools are also great pieces for plyometric, elevated, or decline moves. Purchase items that store away so your gym doesn’t take over an entire room. Look for items you can tuck beneath the bed, store in baskets, or tuck on a shelf in the closet. For travelers, look for portable items you can pack up when you are on the go. 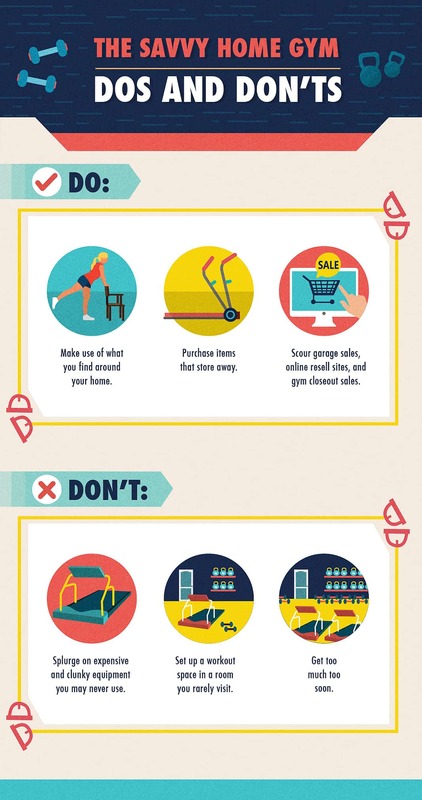 Scour garage sales, online resell sites, and gym closeout sales. Used gym equipment is often just as sturdy as brand new equipment, but at a fraction of the price. Many people get rid of equipment to make more room in their homes or because they don’t want to move it when they relocate. This is an opportune time for a bargain. Additionally, gyms that are moving or going out of business often hold fire sales. Splurge on expensive and clunky equipment you may never use. It’s better to start small and work up to more expensive equipment as you expand your home gym. It can be tempting to purchase equipment because it sounds convenient, but it may turn into a bulky dust bunny cavern instead. Set up a workout space in a room you rarely visit. When training at home, try to allocate an enjoyable space that feels like a sanctuary. Working out next to the washing machine or in a dank basement has less appeal than a cozy corner in the bedroom or a sunny spot on the patio. Get too much too soon. Only purchase items you plan to use in the next few months. Wait to purchase heavier weights and more advanced equipment until you are ready to use it. Home gyms are meant to grow over time as you learn new exercises, increase strength, and become more proficient at training. Think of gym equipment as a reward for all that hard work. It feels great to go out and buy heavier kettlebells or a pull-up bar when those muscles get stronger. Resistance bands pack a lot of power into your workout without taking up space in your home. Exercise tubing, loop bands, mini bands, and power bands are just a few types of these affordable exercise tools. These bands are available in different levels of resistance: generally light, medium, heavy, and extra heavy. Aerobic step benches provide a useful platform that adds variety to your training. These sturdy surfaces aren’t just for step aerobics. Use them for step-ups, box squats, bench press, lateral lunges, incline push-ups, and so much more. For some moves, depending on the sturdiness of the piece of furniture, you can sub in a stool or chair you already have in your home. Not limited to yoga, a quality mat offers a padded, stable surface to perform floor exercises. Mats also protect your flooring from sweat and dirt that may build up while you exercise. Bodyweight exercises alone can build strength and endurance, but adding weight elevates training to a whole new level. Kettlebells and dumbbells each offer their own unique benefits to training, and both have pluses and minuses. Kettlebells require a slight learning curve, but once mastered, they often become a preferred resistance-training tool for many because a single kettlebell can be used for multiple exercises. Kettlebells are also more compact as they go up in weight, so a 30-pound kettlebell takes up less space than a 30-pound dumbbell. Another versatile resistance training tool, medicine balls can be used for explosive movements, core work, squats, and sports-specific training. Medicine balls come in different shapes, sizes, and materials. It’s best to research which type works best for the exercises you plan to incorporate into your workouts. Though it can be added, a pull-up bar helps build a strong upper body and core. Bars can be mounted into the wall or hung from a doorframe and easily removed after each workout. Kettlebells are great tools for strength and resistance training, but they can cost a pretty penny. Not all kettlebells are created equally and less expensive brands may have imperfections that can cause injury when using them for certain lifts. On average, kettlebells cost a dollar per pound used and sometimes two dollars per pound brand new. They are worth the investment, but not always budget friendly. A homemade adjustable T-Handle is a great tool for swings, deadlifts, and squats. With just a few pipes and a set of weight plates, you can fashion a DIY kettlebell that adjusts to several different weights. Weight plates typically cost less than a dollar per pound (when purchased used) and can be found at used sporting good stores or on sites including eBay or Craigslist. Aerobic step benches are a great addition to any home gym. A good step bench set with two risers costs around $100. Any additional risers cost more. That can add up quickly and take a huge chunk out of your home gym budget. The local hardware store has everything necessary to build steps and boxes. Most stores will cut a certain amount of wood, so arrive with your measurements ready to go. This video shows a basic step bench tutorial. Build several of these and stack them to create the same effect as risers. Start small and add more as you progress with training. This blog post shows a tutorial to make a homemade box for squatting, hip thrusts, and step-ups. Adjust the length and width to suit your space and needs. Depending on how you finish them, these boxes can also double as a multifunction ottoman or coffee table in tight spaces. Strength training is synonymous with barbells and they are a much-desired addition to any home gym. The cost of a good set can add up quickly, and they also take up a great deal of space—which doesn’t work well in tight quarters. Sandbags are a great alternative to barbells since many of the same exercises can be done using these homemade tools. For around $50, this tutorial gives you all the advice you need to build a good sandbag for home workouts. An alternative to one heavy sandbag is to pack smaller amounts of weight into several bags. Take out and add weight to your larger bag as needed for a more customizable piece of equipment. Not in the mood for messy sand? Try this no-leak sandbag trick using wood pellets or ropes instead. Medicine balls store easily, work for many routines, and are great for kids to use, too. Just like any sports equipment, having just one may not cut it (and these aren’t cheap). Put that flat basketball in the garage to use with this DIY medicine ball. Supplies cost less than $10 (minus the ball). Fill multiple balls to different weights to create a full medicine ball set. Jumping rope gets the heart revved, but finding the right length is a little like Goldilocks finding the right porridge temperature. Rather than splurging on a custom jump rope that can cost upward of $50, try making your own. This tutorial demonstrates how to make a custom length speed rope using materials from the hardware store. The materials shown cost less than $5 and can make up to six jump ropes. The Equalizer is a portable exercise tool that adds variety to everyday training. From dips and rows to lunges and split squats, it ramps up any exercise routine, but costs more than $100. The hardware houses all of the necessary items for this at-home alternative to an expensive piece of exercise equipment. This blog post demonstrates how to craft an Equalizer out of PVC for a fraction of the cost. That awesome home gym won’t do much good unless it’s put to use. Check online for loads of home workout videos that fit the needs of any lifestyle. 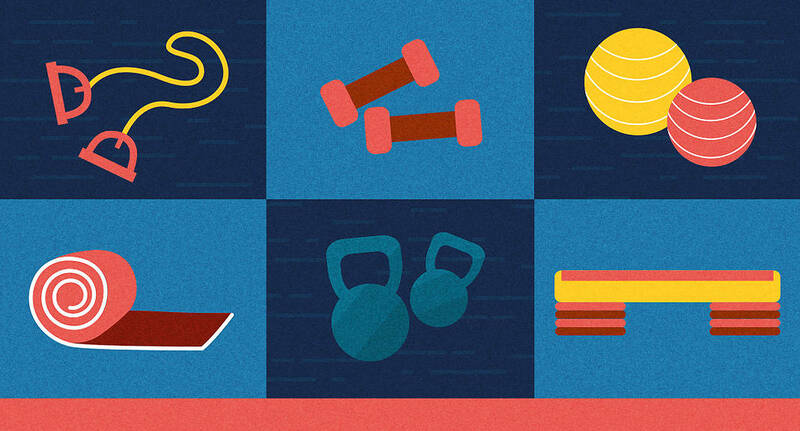 Find routines that fit your fitness level, offer plenty of variety, and also work with your schedule. With a few essential pieces, you will be well on your way to enjoying workouts right in the comfort of your own home.